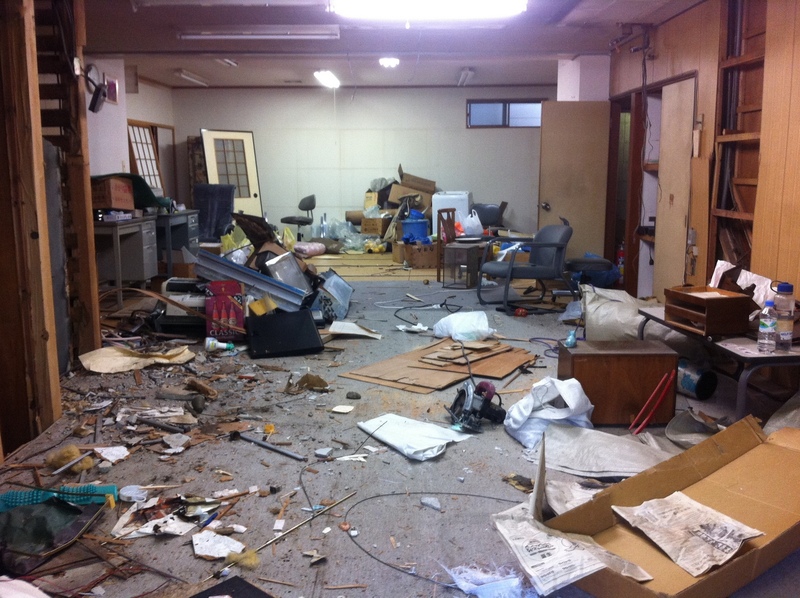 Accommodation in Kyoto can be tricky and expensive. Many apartments require a deposit, key money (non refundable, usually equivalent to 1 or 2 months rent), a guarantor, and come unfurnished. I was lucky to be introduced to Expo House (by Fareea) when I first came here. On my first stay I rented a room in one of several Expo House ‘share houses.’ I had my own room and shared the kitchen, living room, and bathroom with the other three residents of the house. Now I stay in an apartment managed by the same owner, Yusuke-san. 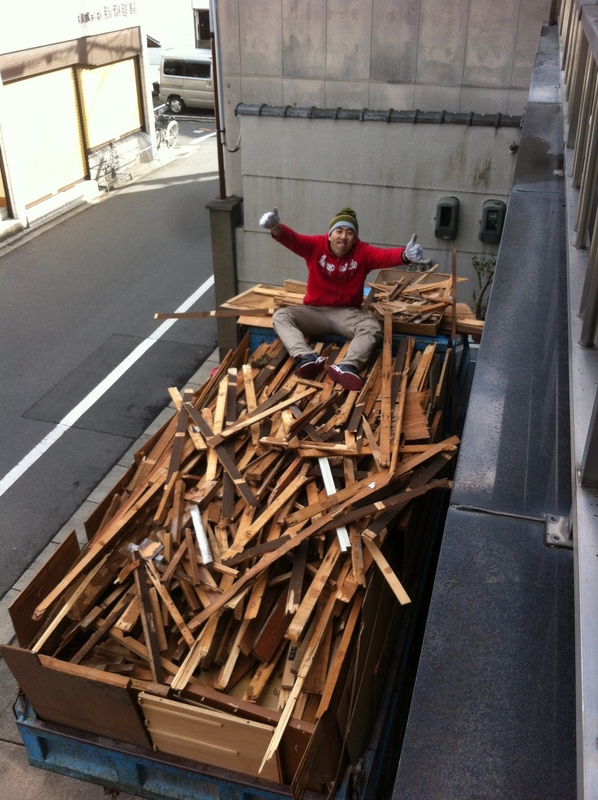 Yusuke-san on a pile of debris ready to be sent to the recycle center. 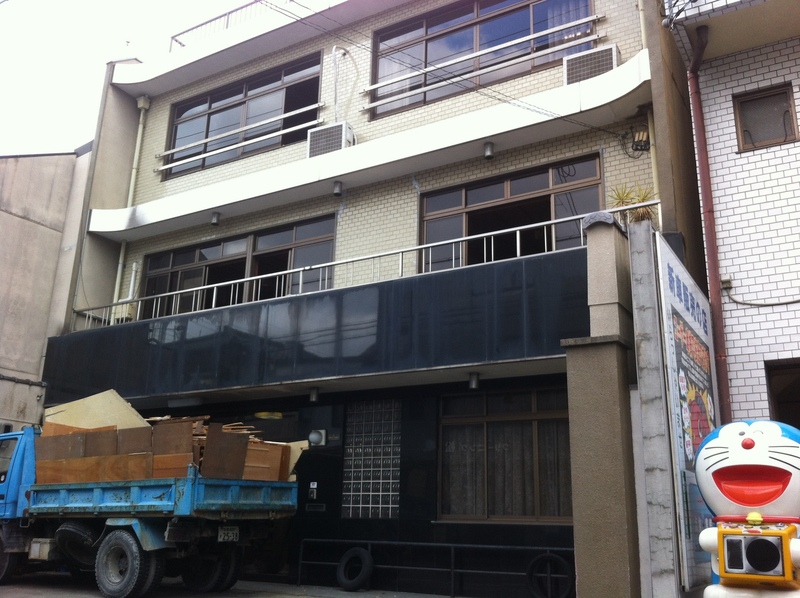 Yusuke-san has 8 Expo Houses now and is renovating an old kimono factory into a cafe/hotel/share-house. I needed some spending money to cover my research trip costs and signed up when Yusuke-san put out a call for some part-time workers. For the past two weeks, I’ve been demolishing walls, dismantled a freight-lift, jack-hammered concrete floors, pulled down ceilings and have moved tons of material into Yusuke’s truck. My first day at work I was told to remove the lift from the 2nd and 3rd floors. Taking a sledge hammer to the lift wall. Pent up frustration anyone? Disconnecting the wires to the freight lift motor. I hope that the power is cut! My colleague, Dan. We move piles of debris like this twice a day. Usually it gets thrown from the 2nd floor window! Mr Ogawa-san is super cool and fun to work with. Jack-hammering concrete to make way for a new staircase. The house is framed with steel. We cleared the layer of cement off the steel floor. The steel floor will be cut out to make an atrium. The front of the building – built in the early 1970s. Ground floor interior before we cleared out the left over junk, pulled down the ceiling, and cleared out the rest of the lift. Dear Ken, now I see what you are doing. That is a big job. I hope he is going to insulate all the apartments. Love, M.
WOW! Back breaking stuff 😦 but good for venting!